Sometimes it can be the smallest thing that inspires a layout. Last night I was working on a card and I heat embossed the (retired) CTMH Funky Blossoms Stamp Set on Black Cardstock. It didn’t end up working well with the card I was making but they were just too pretty to toss aside. I’ve had this photo of my brother, my niece and my son in my work space for sometime so last night seemed like a great night to scrapbook it. Those little heat embossed Funky Blossoms were the starting point of the whole layout. I grabbed paper out of my stash (Crate Paper, Basic Grey, Studio Calico and maybe even some October Afternoon??) I have mentioned before that I’ve recently developed a new fascination addiction with cut files, especially cut files from The Cut Shoppe Etsy Store. I used the Tiny Triangles Cut File on the flower pattern paper. I had originally cut the triangles as a full 12×12 sheet but I felt like it was too overpowering so I trimmed it down and layered it on top of the grid paper. Next comes the cluster surrounding the photo. I grabbed a couple different patterns (xoxo & polka dot) and cut/tore the paper to size. I wanted to enhance the yellow that is found in the flower pattern paper so I grabbed a scrap golden piece of cardstock to mat my photo. The yellow was a little too bold so I covered the cardstock with black tulle. I still felt I needed a little buffer between the yellow cardstock & my photo. I’ve been watching a lot of Missy Whidden process videos and I LOVE the way she uses vellum to mat her photos. So I went with it and added a folded piece of vellum under the photo. Now onto my favorite part of the layout…the embellishing! I added a tab sticker on either side of the yellow mat along with a couple strips of CTMH Black Shimmer Trim. I added a kraft flower ( I believe is from K&Company?) and I added a small ruler & the happy day chipboard pieces (unsure of the labels-they were just laying in my stash). OH, I can’t forget what started this whole layout…the gold embossed flowers tucked here and there. I also tore a grey ruler sticker (another Missy Whidden tip) and added it under the photo mat. I wanted the title to mock the gold & black from the funky blossoms but I didn’t have any Thickers that had both of those colors. Instead I grabbed CTMH (retired) color ready cork alpha stickers and used CTMH Black Exclusive Ink™ to color them. It takes A LONG TIME for the ink to dry after inking the letters so while they were still slightly wet I sporadically dropped Gold Embossing Powder over the letters and then heat embossed. As I began adhering this all together I still felt like the flower pattern paper needed to be muted/buffered from the photo cluster. I grabbed a sheet of vellum and layered it in between. To mimic the gold throughout the layout I added a little messy gold stitching. I also added a large doily to the photo mat/cluster. After everything was adhered I added my journaling and a Heidi Swapp date stamp. I’m really pleased with how this layout turned out! I love the details that the cut files bring to the papers & layouts! So much fun!! 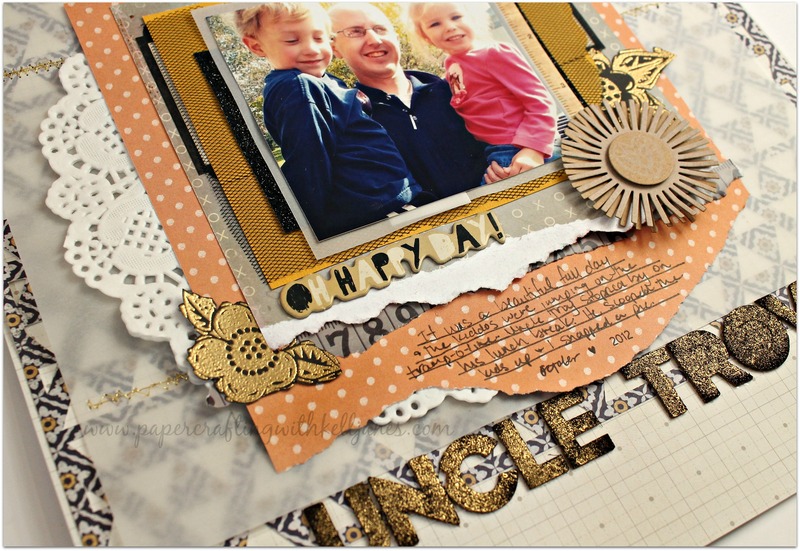 I’m linking this layout to the November Challenge at The Cut Shoppe Blog.